Beautiful, exultant folk tune centered around a ukulele strum which gathers sparkles of what sounds like thumb piano, with lovely clarinet flurries. Reminiscient of Sufjan Stevens although less formal, more down-home. A tantalising foretaste of the Bristolian's upcoming album, most of which was recorded during a 2-month trip around Japan, which is the kind of back story that also gets me going. The other album track heard by UOH, Sticking in pins, favours strings, ukulele, brushed snare and massed vocals, to equally uplifting effect. Have a listen to this, another great tune from last year’s Elephee EP. And another track from Bite the mountain that just came to light. And apparently, this is the novel. As you know, Efterklang are playing in Cork this coming weekend, at the Savoy Theatre, Saturday night July 30th. And by the sounds of this, from the Efterklang website, it will be very special. "Efterklang+Daniel Bjarnason & Their Messing Orchestra is a special 17 piece band that debuted at the Cross Linx festival tour in February earlier this year. It is the 7-piece Efterklang live band with Daniel James (of Canon Blue) on guitar, Heather Broderick on piano and Peter Broderick on vibes and steel drum. And then we have the brilliant Icelandic composer Daniel Bjarnason on Rhodes and then you add a saxophone quartet, a brass quartet and a classic percussionist. This all turns into Efterklang + Daniel Bjarnason & Their Messing Orchestra. We will be playing Efterklang songs with arrangements for the Messing Orchestra by Daniel Bjarnason." It features lots of woozy synths and what sound like cut-and-paste guitars, as well as the memorable opening line, "I spent the summer on my back". It also sounds like Annie Clark has been listening to some dirty funk music since the last album. You can view some fairly strange video teasers on that site too, including one where Ms Clark, as well as several other beautiful women, deliver some of the most polite, delicious, crushing rejections ever to camera. It's disconcerting and intriguing at the same time, quite like her music actually. renovated church ceiling, you could have been back in time by a couple of hundred years, such was the antique quality of the music*. This was Ryan Francesconi playing at Triskel Christchurch in Cork last Friday, a sublime match-up of artist and venue, if ever there was one. Before saying any more about the gig, here's a few lines from a review of his current album that caught my eye. 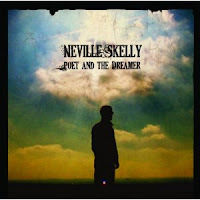 We had a couple of excerpts on this week's show of a recent interview with Neville Skelly, the Liverpool singer-songwriter, whose debut album Poet & the dreamer is out now through Setanta/PIAS. It was a very interesting conversation, taking in Neville's early big band and song stylist influences (courtesy of his father and uncle), how crooning is not a dirty word, how he hooked up with near-neighbours The Coral who introduced him to Dion Dimucci (of Dion & the Belmonts fame), earning his chops on open-mic slots, and more. Listen to the full interview here. I was catching up on some of the 4AD sessions and came across this fantastic footage of Ariel Pink and friends. If nothing else, check out Menopause Man, from last year's great album Before today, for a sublime mixture of math-rock and 10cc-ness. I must say I also like the drummer's shirt - it's kinda hairy. To match his bear growls. ...including talk of Morton Feldman, a classical music training, "happy accidents", high art vs low art, Carlos Castaneda, supernatural themes, the influence of travel on composition, and more. Listen here. That interview was recorded last October around the time of the release of his current album, Dislocatia, on Hidden Shoal. Did I mention it's brilliant? Here's how much I liked it at the time. As an interesting adjunct to the Van Dyke Parks post last month, surprising news now of a Skype conversation between VDP and Seán O'Hagan of High Llamas. No connection to the fast-developing News International phone hacking scandal here, the news was revealed by the Llamas' label Drag City. (By the way, the Drag City monthly newsletter is one of the most entertaining mailshots going, I recommend you sign up without delay.) Here's the video. A few things of note. VDP's conversational style is as meandering and quixotic as his wonderful back catalogue. This is a man who you don't want to stick to the point. The time delay on Skype creates awkward pauses. And speaking of William D. Drake, I believe his hands make an appearance in this video (although I could be wrong). That's from the new North Sea Radio Orchestra album, I a moon. In a word, it's fantastic. I'll have a bit more on it at the end of the month. NSRO is Craig Fortnam and friends (that's him on guitar). Craig also released one of my favourite albums of last year under the name Arch Garrison. Here's a few thoughts on that at the time. Arch Garrison is mainly Craig Fortnam of North Sea Radio Orchestra. This is a gorgeous album of ancient-sounding English folk music, with a few nods to modernity. Song titles like Stone on the pound, Thames Fluvius and Roman Road give a hint of tradition but this never feels clichéd. Great tunes help, as usual, and an irrepressibly upbeat mood. So anyway, I mentioned something in the William D. Drake review a couple of months back that I wanted to come back to. At the time, I said that the instrumental track Ziegler from his album, The Rising of the Lights, reminded me of the Wanderly Wagon theme tune. For the uninitiated, this was an Irish children's tv show from the 1970's, focused around the wide-eyed genius of puppeteer, the late Eugene Lambert. (For those of another generation, it also regularly featured the actor Frank Kelly - Father Jack from Father Ted - as the bungling evil wizard Dr Astro.) So here's the theme tune. Listening back to it now, it starts with more of a Beach Boys feel, with that signature alternating left-hand-right-hand keyboard style, before launching into full prog-rock glory with a creamy guitar solo. Nothing like Ziegler, in fact. Which sounds more like this. This great swinging folk-rock tune has a distinct flavour of Sparklehorse at his laconic best. From the album I want that you are always happy. Prepare to be enchanted and transported by Welsh-born-of-Iranian-descent Roshi Nasehi on vocals and electronic backing by Graham Dids (Pere Ubu). The title translates from Farsi as "Come to me beloved" and the mood has an appropriate emotional heft to it, with deft, minimal soundscapes adding colour. A voice capable of making a name for Iranian folk music. We played the Eyan Green remix of Leeds band Vessels' Later than you think on the show last week. Eyan got in touch with the permanent link for downloading that remix for free. Check it out here. A techno juggernaut on the face of it, but with distinct krautrock affiliations. In other words, really cool. Meanwhile, here's the band playing the original live in Brighton earlier this year. Beautiful Tortoise-meets-Mogwai-post-rock-launched-into-space vibe and lovely video made by Fix the Sky. Vessels - Later Than You Think (live) from Vessels Band on Vimeo. As we're at it, here's the wonderful first single from the still current album Helioscope, on Cuckndoo Records, featuring Stuart Warwick on vocals, which got plenty of air around here earlier in the year. And the impressionist video by Kira Zighalina. Great to see Thread Pulls again over the weekend, playing on Friday at the Crane Lane Theatre in Cork. They make some racket for just two fellas and a (small) bit of machinery. One of the highlights of the gig was this, from their New thoughts album that came out last year on Osaka. I'm not sure about the choice of venue, although it was quite amusing watching what the Crane Lane weekend "regulars" made of sparse rock 'n roll, stripped to the bone. Not as entertaining as the gig itself, mind you. I spoke to them when they played in Cork last year, you can check out that interview here. Also on the double bill were fellow Dubliners Twinkranes, a band I hadn't seen before. They brought drums and organ, with electronics, and were pretty impressive in a driving, krautrock kind of way. We like a bit of motorik, in fairness. You'll get an idea from this. And have a look at their eye-catching hanging backdrop here.